History and background of Pierre Cardin. Over the last half century, Pierre Cardin has accumulated every role, as a visionary designer and a tireless businessman. He is so famous, that in China, he is sometimes mistaken for the French president. He can take credit for not only re-thinking clothes, but also for transportation, environmental design, food and drink. He has for years astonished the world with his innovations. Over the last half century, Pierre Cardin has accumulated every role, as a visionary designer and a tireless businessman. He is so famous, that in China, he is sometimes mistaken for the French president. He can take credit for not only re-thinking clothes, but also for transportation, environmental design, food and drink. He has for years astonished the world with his innovations. As a couturier, he has been restlessly inventive, experimenting with the notions of abstraction, exaggeration, technique and technology. As such, he comes under the category of Architect Designer. When you buy something by Pierre Cardin, you are not buying his name, you are buying his eye. On 6th July, 1922, Pierre Cardin was born in San Biagio di Callalta, outside Venice while his French parents, a wine-maker and his wife were living in Italy. They returned to France soon after. Their son, who was in school at the time, became fascinated simultaneously by costume design and architecture. In 1936 at 14, he was already a clothier's apprentice, learning the basics of fashion design and construction. In 1939 at 17, he left home to work for a tailor in Vichy, where he began making suits for women. During the war, he worked in the Red Cross. In 1944 after the Liberation of France, Cardin went to Paris. In 1950 Cardin opened his own salon and in 1953 began his life in Haute Couture, setting up the Maison de Couture in the rue Richepanse. Most of Cardin's early designs were day suits and coats with raglan sleeves, dresses that foreshadowed the sack line with their front-defined waistlines and Watteau backs. Some suits and dresses had tulip-shaped skirts and boxy waists, brushing jackets with rolled or scarf-tied collars. He also designed coats with draped hemlines, bubble skirts and unstructured chemises. In 1954 Cardin opened a boutique for women called Eve". His bubble dresses took the world by storm. In 1957 a boutique for men "Adam" opened. In this year, Cardin made his first trip to Japan. He was made an honorary professor at Bunka Fukusoi, the Japanese Design college and a Pierre Cardin award was started there, which is awarded to the best student. 1958 Cardin again presented suits with bubble shaped skirt, tied into a band at the hemline. 1959 He was the first couturier to turn Japan into a high fashion market. In this year, his first collection of ready to wear was shown at Printemps department store in Paris. 1959 Cardin was expelled from the Chambre Syndicale de Haute Couture because he had launched a ready-to-wear collection, the first couturier in Paris to do so. However he was soon re-instated. 1960 Cardin launched the first designer men's styles. His famous "Cylinder" collection was launched by 250 students. By the 60's, Cardin's reputation had grown considerably, he had become a well-known designer in love with science-fiction, with astronauts, the cosmos and the future. Cardin had perfected immaculate, sleek tailoring and allowed his febrile admiration to catch fire. His clothes had the trappings of science-fiction and space travel. The world gasped at his space age 3-D shift, his astronaut men's look and his "white breasts" dress. He made dresses out of vinyl, hammered metal rings, broaches of carpenters nails, and diamonds. The clothes shrunk in size as the patterns grew. Knitted catsuits, tight leather trousers, close-fitting helmets and batwing jumpsuits were all in his collections. 1963 The "cosmocorps" collection featuring coloured tights, roulette trousers, demonstrated, Cardin's tireless quest for the future. 1964 Cardin presented a collection of mini-shifts, bisected bi-coloured dresses, with zigzags or a diagonal row of his favourite scallops. Throughout the 60's Cardin raised skirts 4" above the knee and plunged necklines back and front, to the navel. His creations revealed a strong forceful designer. 1966 All the triplets in Paris were present when Pierre Cardin showed his first children's collection. Pierre Cardin's children's garments were very successful in the US market. 197O He also presented dresses and coats with kimono sleeves and large round cut-outs. In this year, Pierre Cardin created the Espace Cardin in the heart of Paris, a complex which has been a centre for exhibiting the work of young artists, sculptors, actors and other creative people, for more than 30 years. 1978/79 Cardin went to China and set up boutiques, and has been marketing there for 2O years now. 1980 The Metropolitan Museum of Art, New York, presented a Retrospective exhibition of 30 years of Cardin's work. He also inaugurated his new premises on 57th Street, in New York. 1989 Pierre Cardin visited India and presented spring/Summer collection on February 11th. During the 80's there were many activities. In 1982, the Sorgetsu Kaikan Museum in Tokyo, held a Retrospective of Cardin's work. In 1985 at Milan, Ascot Brun award was given to him for creativity. He also received the Fashion Oscar from the French fashion industry, in Paris in 1985. In 1986, he signed a contract with the USSR for local ready-to-wear. In 1987, he opened a 10,000 square metre showroom in Moscow. In 1990 Pierre wrote his autobiography entitled "Past, Present and Future" putting down all the interesting parts of his life. This book is a little difficult to find, but sometimes comes up on the Amazon.com "used" section. 1991 He was made Honorary Ambassador to UNESCO. He designed jewellery and a Chernobyl medal which were sold for the benefit of UNESCO. Cardin held a fashion show the same year in Moscow, before 200,000 people. 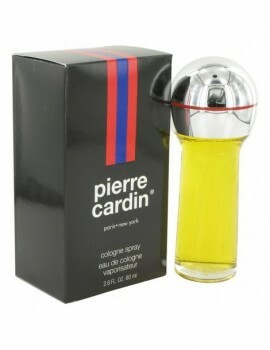 1992 Pierre Cardin was made a member of the Academie Francaise. 1993 He held his first collection in Ho Chi Minh city and in Hanoi, both in Viet Nam. 1996 At the 26th Olympics in Atlanta, USA, Cardin presented his Evolution collection which is intended for the 16-25 age group. He subsequently showed it also in Paris. 1997 There was a Retrospective exhibition of 50 years of Cardin's work, in Paris. 1998 He revealed his plan to build a 133 metre high fluorescent obelisk near the site of the ancient Alexandria lighthouse in Egypt which tumbled into the sea about 600 years ago. He unveiled a model of the obelisk which will be covered in mirrored glass, with 16,500 computer controlled lights inside to cast beams 69 km out to sea. The Egyptian government has approved the plan. Launched by the design house of pierre cardin in 1972, pierre cardin is classified as a refreshing, subtle, oriental fragrance . This masculine scent possesses a blend of fresh and spicy, a scent that lingers, very male. It is recommended for romantic wear.